It may not seem it but I'm a super disorganised person! I generally write blog posts the night before and I never seem to be able to keep on top of emails - even important ones, eek! However, in the past 2 years I've become a daily planner fan! I have a whiteboard, a tear-off planner notepad, a swish ring-bound desk planner and I even have my own personalised planner sheets... just because! It's all a bit obsessive, but it keeps me on track (kind of)! 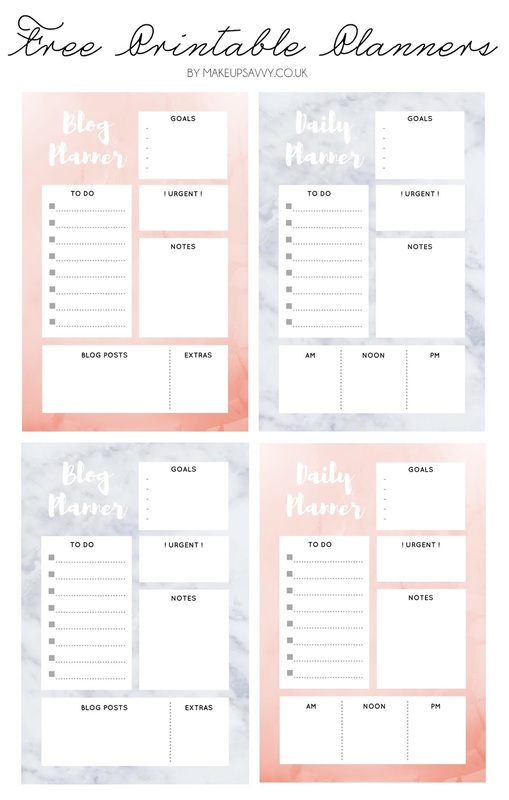 So I thought I'd share the love and create some free printable daily planners for anyone that wants one! Speaking of free stuff, I also have a set of 10 free styled stock images for bloggers HERE that you may find useful! Let me know if you use one of the free planners in the comments below or over on Twitter @makeup_savvy!